Pantry Decimation Challenge 2012: Commence! 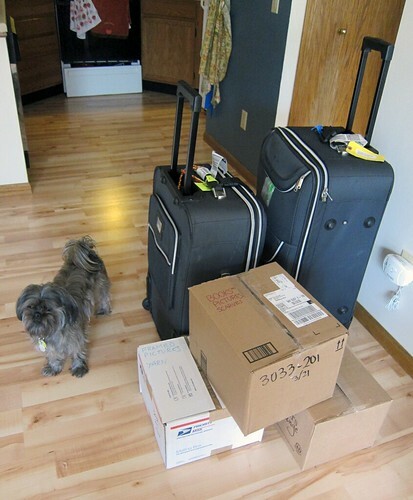 In my opinion, moving is one of the most stressful situations we mature adults have to deal with (y’know, aside from things like illness and losing your job and, um, important stuff). 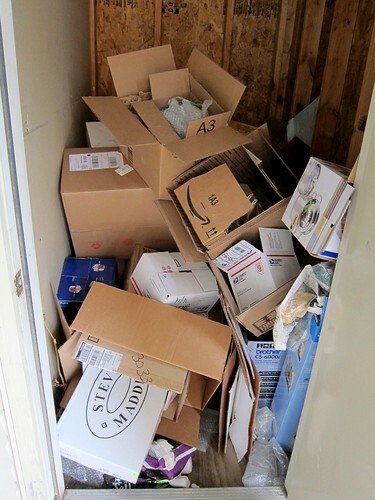 First you need to shove everything you own into countless boxes, then you have to load all of those boxes into a truck or your car or lots of people’s cars, and then you have to remove all of those boxes that you JUST LOADED and put them in your new place. There’s lots of heavy lifting and strained arms and realizations of your sad state of strength. And when your finally get all those boxes into your new place, you’re exhausted and sweaty and sore and irritated and all you want to do is kick your feet up, mix yourself up a big-girl drink, and watch a stupid, mindless movie. BUT YOU CAN’T, because everything you own is IN THE DAMN BOXES, and you have to unpack them all first! It’s the worst. I hate it. It stresses me out. …in case you’re abnormally slow to infer things, I’m moving. I briefly mentioned my moving plans a few weeks ago, but now it’s a month away and I’m entering into moving!panic mode. See, I’ve moved before, but this is the first time I’m moving when I own real furniture, like a couch and a bed and crap like that. I’m only moving one town over, but it might as well be a state over – the amount of work involved is pretty much the same. It doesn’t help that I will essentially be homeless for 24 hours during the move. I need to be out of my current place by noon on a Saturday, but I can’t move into my new place until noon Sunday. Our new place, I should say – S and I are becoming grown-ups and moving in together. Hooray! Not hooray that he’s in the exact same situation and will also be homeless for a day. Alas. At least we will be homeless together. Yes, I have already started packing. Winter clothes and books are ready to go! I think we’ve got our homeless plans mostly figured out (yay for friends), but I don’t have a good solution for storing our perishable foodstuffs during that homeless period, which means that I must use up all my frozen and refrigerated goods before we move. And that is why I am designating June as my official Pantry Decimation Month! I will attempt to use up as much food as possible, to reduce having to cart around boxes of 8,474 types of rice and also to avoid wasting refrigerated goods that I’d have to get rid of. This weekend I kicked off my challenge by burning through some frozen veggies with Happy Herbivore’s Biscuit Pot Pie. I used frozen broccoli, frozen peas, and – most notably – some frozen green beans that are probably two years old. I am very wary of freezer burn (I have very finely tuned senses when it comes to that particular smell/taste), but by rinsing the beans in water to remove their thin coat of ice crystals, I somehow managed to avoid it. The pot pie was not as good as the last time I made it (when we used a bag of mixed frozen veggies), but it was still yummy. It was not, however, very pretty, so you don’t get a picture. Instead, how about a tally of my pantry decimation thus far? Frozen peas: Used half a bag. Frozen green beans: Used half a bag. Frozen broccoli: Used half a bag. Frozen blueberries: Used a quarter of a bag (not in the pot pie, duh). Frozen raspberries: Finished a bag (same comment)! What’re your pantry-busting tips? How do you feel about moving? I hate moving so I feel for you. I don’t like packing. Here’s a suggestion for the frozen broccoli — make the quizza from Ricki’s blog, Diet dessert and dogs. It’s really good, and you can use a lot of frozen veggies in it. Of course it’s probably better with fresh veggies, but I got rid of a LOT of frozen spinach and broccoli and the quizza was delicious. I’ve got a post about it on my blog, too, with a link to the recipe. Hope your move goes smoothly and you enjoy your next adventure. Alas! I used up my frozen broccoli in a lackluster noodle dish. What a shame – Ricky never steers me wrong. Hopefully this will be the only time the the two of you are “homeless”, unless if is when you are moving eastward! Wish I was there to help you #1. I wish you could come help us too! My favorite part of moving is donating things – food, clothes, old gifts, etc. I love getting rid of things, and I know what I’m giving away might help someone else. Congrats to you and S on the move! Also, good luck with those deadlines. I love donating things, too – I’ve already given away two big bags of clothes, but I’m sure I’ll come up with more throughout the packing process.